Lhamo Tso is our elegant Amdo girl from North-eastern Tibet. Her hair is braided into tiny plaits (traditionally 108! ), which are adorned with many colourful beads. She wears a traditional silken shirt, trousers and felt boots under her exquisite chupa robe – tied in typical manner with a red silken belt. The product is filled with 100% sheep’s wool and can be handwashed. The clothing is made from cotton and synthetics. All garments can be removed. Additional outfits and rucksack can be purchased on the accessories page. Please note: While maintaining a distinct style, due to its handcrafted nature, each product will vary slightly and fabrics used for the garments are frequently changed. 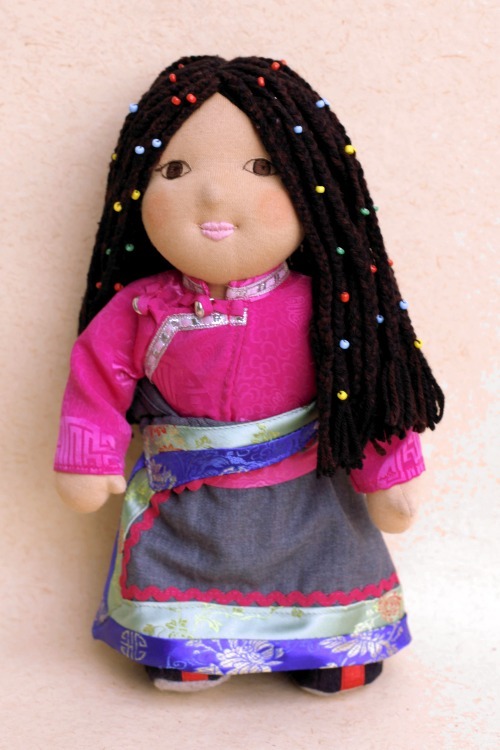 If you have any preferences for material colours or would prefer a darker skin tone (like Samdol), please contact us via email at info@dolls4tibet.com.